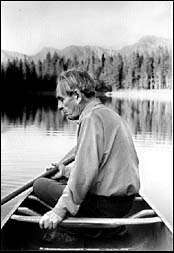 Norman Maclean was born December 23, 1902. He will forever be associated with the mountains and rivers of Montana, but he was born on the rolling plains of Iowa. His family moved to Missoula, Montana in 1909. Maclean came to the University of Chicago in 1928 to pursue graduate studies in English. Three years later he was hired as an instructor and eventually became the William Rainey Harper Professor of English. He won the Quantrell Award for Excellence in Undergraduate Teaching three times during his UC career and served as an inspiring mentor to generations of students. Upon his retirement in 1973, Maclean turned to writing, drawing material from his youth in Montana and his fascination with the Mann Gulch Fire of 1949. In 1976 the University of Chicago Press had the good fortune to publish a collection of his work, A River Runs Through It and Other Stories. 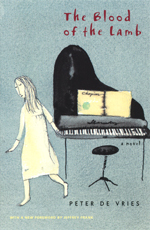 The book was nominated for the Pulitzer Prize and the title novella was made into a movie in 1992. That same year we published Young Men and Fire which won the National Book Critics Circle Award for best general non-fiction. Maclean died on August 2, 1990 in Chicago, at the age . . . The Gazette (Montreal) recently published a review of Peter De Vries’s novel The Blood of the Lamb: "De Vries was a master of puckish pedantry. His marvelously erudite sentences are often inverted and complex, but they always end up where he wants them.… humour is a welcome gleam of wry rationality shining through the dark clouds. This is a deeply touching book whose sincerity and universality are likely to ensure its future." The most poignant of all De Vries’s novels, The Blood of the Lamb is also the most autobiographical. It follows the life of Don Wanderhop from his childhood in an immigrant Calvinist family living in Chicago in the 1950s through the loss of a brother, his faith, his wife, and finally his daughter—a tragedy drawn directly from De Vries’s own life. Despite its foundation in misfortune, The Blood of the Lamb offers glimpses of the comic sensibility for which De Vries was famous. . . .
A passage about the truth-telling power of fiction, from the closing paragraphs of Norman Maclean’s novella A River Runs Through It, is being cited in commentary about James Frey and his apparently fictionalized memoir A Million Little Pieces. (For example, this piece by John MacDonald in the Arizona Republic.) Near the end of the story, Norman’s father speaks to him: “You like to tell true stories, don’t you?” he asked, and I answered, “Yes, I like to tell stories that are true.” Then he asked, “After you have finished your true stories sometime, why don’t you make up a story and the people to go with it? “Only then will you understand what happened and why.” We have an excerpt from the opening pages of the novella. . . .
Today Zulkey.com features an interview with Stuart Dybek, author of Childhood and Other Neighborhoods. In the interview, Dybek talks about one of the stories from the book, titled "The Long Thoughts": Have any of the characters in your stories had impact on your real life relationships? Meaning that, if somebody recognizes themselves in one of your stories, how has that impacted his relationship with you? Despite the fact that I’m writing fiction and have taken the liberties that fiction allows for, people have at different times recognized themselves in some of the characters. Mostly the reaction has been favorable. I had one old friend who appeared in a story called "The Long Thoughts," who would give the book that story appeared in to people as gifts so that they could read about him. There was an instance however when a dear friend who saw himself in one of my stories—a version of a story that he told to me—was offended not by his portrayal but that I would use a story he’d told to me in private. I should add that the story he told to me was fantastical and I changed it further and made still more fantastical. Still, . . .